Vacations are the best, no matter what time of year you’re going or who you’re going with. But every now and then even those of us who would not necessarily identify as “adrenaline junkies” need a little thrill, an excursion with bite, if you will. When planning your next getaway, consider the following 10 craziest activities located in stunning luxury vacation destinations around the globe. Between its year-round warm water and its stunning natural beauty, a trip to Costa Rica brings with it the chance to experience world-class rafting in a lush paradise. The country’s 14 major river systems produce renowned white water rapids, as well as breathtaking scenery along the banks. Whether it’s a day trip or an overnight excursion you’re after, your personal concierge would be delighted to set you up on a tour that suits your needs when you book your luxury villa rental in Papagayo. When visiting the majestic land of Punta Cana, opt for a taste of the wild side by booking a full or half day Xtreme Dune Buggy Tour. These are not go carts! Xtreme Buggies are larger, have VW engines, and can go places other buggy outfits simply can’t access. Expect an unforgettable rough and tumble ride through the beautiful countryside, the “Dominican Alps,” and along Playa La Vacama’s 15 km stretch of desolate, sandy beach. Additionally, take time to explore and relax at Laguna Limon. Adventurous children also welcome! Join Punta Mita Adventures for a zip through a stunning treetop canopy on a series of thrilling zip lines—including Mexico’s longest and fastest one at over 4000 feet in length—reaching speeds up to 60 mph! 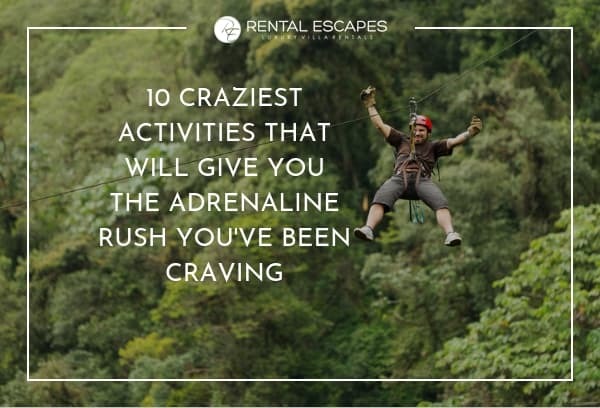 This adventure also includes two amazing rappels off elevated treetop platforms, a shaky climb up the 50 foot-high Crazy Ladder, a ride on the Tarzan Swings, plus suspended walkways and hanging bridges. Other options? Off-roading through the jungle, or a refreshing dip via thrilling hillside waterslide! Sold? Book your villa rental in Punta Mita today. JetBlade Barbados attracts hot-shot adrenaline junkies, excited newbies, and curious locals from all around. Jet blading, aka hydroflight, is championed as the most memorable water sports experiences in Barbados. Participants are propelled up to 15 feet in the air with a water-fueled jet pack. All flight takes place under the safe supervision of highly trained instructors of course, and there are plenty of floatation devices. Even if you can’t swim, you can still enjoy the water with this unparalleled excursion! When you book a luxury vacation rental in Maui, you simply mustn’t forego the incredible opportunity to take a helicopter tour. You’ll see sections of the island you wouldn’t have been able to otherwise. Prepare for a spectacular aerial view of beaches, forests, cliffs, valleys, and volcanoes. If you’re feeling bold, you also have the option of taking the doors off for an even better view. Popular routes include the west Maui mountains and the Haleakala Volcano. Get up close and personal with the great white shark by diving right in at select spots in Gansbaai, South Africa, just south of Cape Town. Gansbaai is thought to be the world’s great white shark capital, and there are tours that take you out to sea, teach you shark manners, and then lower you down in a cage to meet the sharks, who will swirl around with curiosity while you remain perfectly safe. Rest assured, Great White Shark Tours has a 20-year unblemished safety record. St. Lucia isn’t only made up of stunning beaches. Its lush, mountainous interior is ideal for mountain biking, with extensive jungle trails well-suited to both beginners and seasoned bikers. The Anse Mamin Plantation is a 600-acre estate with over 8 miles of trails that act as a naturally occurring roller coaster for thrill seekers. If you’re an advanced biker, there is always Tinker’s Trail, an incredibly steep trail up the side of a mountain that provides spectacular views. The way down is a blast, but definitely not for the faint of heart! Cross the cascades of Dunn’s River Falls on an exhilarating guided trek in Ochos Rios. You’ll get to climb cascading waterfalls, have help from other travelers in slippery spots, and spend time cooling off in gorgeous natural pools along the way. With help from others, you’ll criss-cross areas of rushing water hand-in-hand to work your way to the top of these spectacular falls, which extend across more than 600 feet, making it one of Jamaica’s bonafide national treasures! When in Grand Cayman, you can’t miss Stingray City. Take a private luxury charter out to visit stingrays so accustomed to humans they come around as soon as they hear the sound of boat engines. Be sure to book a private tour with your friends or family to avoid larger crowds, as this excursion is popular, with reason: visitors get the chance to interact with the stingrays individually, and away from the cattle boats along the sandbar. Every diver or snorkeler who dares get in the water with these prehistoric looking creatures is sure to meet that adrenaline rush they’ve been seeking! If you’re seeking adventure in the Bahamas, try diving off Grand Bahama Island. You’ll find sunken Spanish galleons, inland blue holes, underwater caves, and forest-like coral reefs brimming with marine life. You can even feed and swim with reef sharks for a real thrill. Thunderball Grotto in the Exumas is a fantastic underwater cave system for exploring as well. You’ll catch sight of yellow-tail snappers, angelfish, and sergeant majors, for starters, and its small, almost hidden entrance heightens its mystique. If any of the above adrenaline-pumping adventures made it onto your to-do list, get started by booking a luxury villa in the destination of your choice, and your very own personal concierge will help book any excursions you desire at the same time. Happy travels, dare-devils!